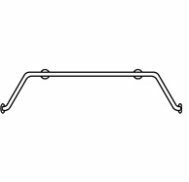 Grab Bars- Commercial grade grab bars made with Type 304 (18-8) stainless steel. Mounting flanges are HeliArc welded to the bar to form a single structural unit. Options include Straight, L-shaped, and U-shaped shower safety bars are available for any application. We offer custom powder coating colors as well as Oil Rubbed Bronze and Matte Black. Used in commercial facilities as well as homeowner residences.